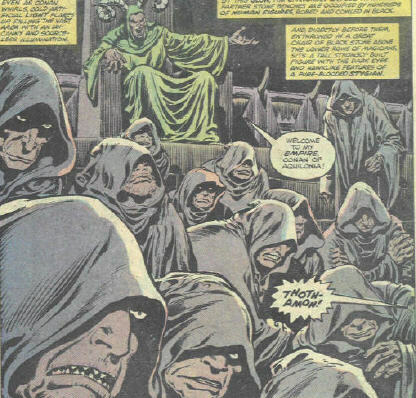 NOTE: While each other the Sorcerers of the Black Ring has their own powers, a common attack is to animate the stone gargoyles which populate the city of Kheshatta, which are themselves petrified demons from early ages. Athyr-Bast once merged several of these into a form with which to attack Zula. HISTORY: The Black Ring is a sect of Hyborian era sorcerers dating back to the days of Acheron, perhaps as early as 15,500 BC. Its exact origins are unknown, but they arose from the worship of the Elder God Set. They commonly practice human sacrifice, and they have mummified a large number of their membership, and stored the mummies in the Temple of Set in Khemi. Acheron and Stygia ruled the world at their prime, but Acheron fell before the Hyborians @ 13, 000 BC, and Stygia was overrun as well, markedly diminishing its power and influence. Nonetheless, Stygia survived, as did the Black Ring, well into the later parts of the Hyborian era, at least as far as 10, 000 BC. The Black Ring has also long served as the hidden power behind the Stygian throne. (Conan the Barbarian I#86 - BTS) - In Luxur, the Wizards of the "Black Circle" made unholy sacrifices to Set in the dead of night. 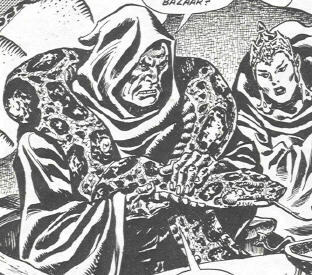 (Marvel Feature I#6) - The unidentified sorcerer sent jackal and crocodile men after Red Sonja as she sought to recover the page for Karanthes, the High Priest of Ibis. 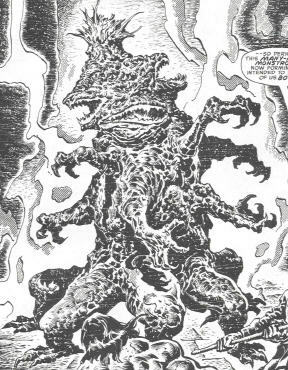 (Marvel Feature I#7) - After Sonja had delivered the Skelos page to Karanthes, the sorcerer took the form of a flying lizard creature and confronted them. (Conan the Barbarian I#68) - The sorcerer stole the page and escaped. (Conan the Barbarian I#68 (fb) - BTS) - The sorcerer used the page to summon forth Valusia's City of Wonders from 8500 years before and, posing as Kull's sorcerer-ally Gonar, advised Kull to conquer Argos to rebuild his kingdom. (Conan the Barbarian I#68) - Conan gave the Fire-Jewel to Kull, which exposed the Stygian sorcerer, and he eventually slew the sorcerer, but the Skelos page burned to ashes as he died. Kull and his city returned to their own time. (Conan the Barbarian I#89 (fb) - BTS) - Thoth-Amon worked alongside Hath-Horeb in Kheshatta. (Savage Sword of Conan#67 (fb)) - Aket-Atum served as a spy for king Ferdrugo of Kordava. (Savage Sword of Conan#67) - Aket-Atum was aboard the ship of Heronan da Varza, who was bringing him to the royal court of Zingara. Da Varza's men attacked the Wastrel, a ship of Barachan pirates led by Conan. Da Varza's men who defeated, and though Aket-Atum dropped Conan with a minor spell, the barbarian managed to hurl a dagger into his chest, killing him. 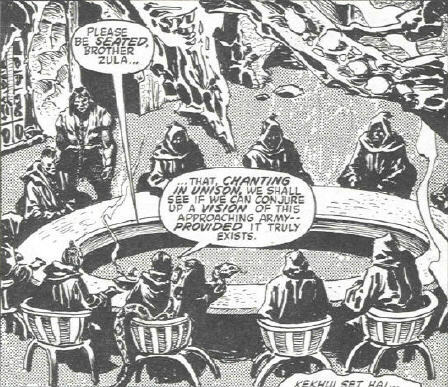 (Savage Sword of Conan#205 (fb)) - Zula joined the Black Ring, earning the approval of Thoth-Amon and the others by demonstrating the training he had learned from Shu-Onoru, such as the summoning of the demon Helgor. (Savage Sword of Conan#203 (fb)) - While Thoth-Amon was out strengthening his bases, Hak-Heru managed to steal the amulet of Imhotep, the Ravage of Worlds. With that amulet, Hak-Heru became able to control Imhotep's demonic Sky Horde, which granted him the power to become Prime-Among-Peers, the leader of the Black Ring, achieved by nature of magical might. (Savage Sword of Conan#205) - Zula convinced the Black Ring to join forces with his "slave" Conan, to fight off an imminent attack by the people of Meroe, led by the Witch-Smeller Ageera. Wishing to prove his value and power to the rest of the Black Ring, Hak-Heru held back his Sky Hordes, forcing the rest of the Ring to expend their power in a nearly stalemated battle against the Meroans. When Imhotep himself--freed by Conan--joined the battle and turned the tide against the Ring, only then did Hak-Heru summon the Sky Horde. However, Imhotep managed to slay Hak-Heru and retake his amulet, after which he directed the Sky Horde to slaughter Meroans and Stygians alike. Conan convinced the Ravager to take his Sky Horde and leave the battle, and the forces of Meroe and Kheshatta separated to lick their wounds and bury their dead. Thoth-Amon then returned and retook leadership of the Black Ring, easily crushing the attempted rebellion of Athyr-Bast. Zula took his leave from Kheshatta and the Black Ring upon noting the return of Thoth-Amon. (Savage Sword of Conan#10) - Thutothemes used the power of the Heart of Ahriman to resurrect the mummified sorcerer Ptah-Mekri. The ceremony was interrupted by a group of Khitan sorcerers, Thutothemes was slain, and Ptah Mekri was left in only partially reanimated state. Conan went on to use the power of the Heart of Ahriman to stop the plots of Xaltotun. (King Conan#2) - Conan and his allies tracked his enemy, Thoth-Amon, to the ruins of Nebthu, where they walked into his trap. Thoth-Amon had gathered the forces of the Black Ring to his side, and their power nearly crushed Diviatrix, Conan, and his armies. However, Conan had recovered the Heart of Ahriman, which, in the hands of Diviatrix, slaughtered the Black Ring, and drove off Thoth-Amon. COMMENTS: Created by Robert E. Howard; adapted by Roy Thomas and John Buscema. In some stories, it has been made to seem that the Black Ring referred to the Ring worn on Thoth-Amon's hand. In addition, other stories have shown that such Rings have been worn by the members of the sect of sorcerers, and in some cases the Rings have served as the source of power to the sorcerer. This has not been uniformly the case. This will serve as a starting point for this profile. I'm pretty certain I have every Marvel Conan story, but as yet, I've probably only read 50% of them, and I've probably indexed less than 10%. So I'm sure I'm missing a lot of stuff. Let me know what I've missed, and I'll include it, or I'll add it to the profile as I find it. Several of the sorcerers from Stygia and Acheron (what eventually became Egypt), had names derived from the Egyptian/Heliopolitan Gods. This includes Aket-Atum (after Atum-Ra), Athyr-Bast (Bast), Geb-Siris (Geb and possibly Osiris), Hak-Heru (Heru-Ur, aka Horus the Elder, an enemy of Seth), Ptah Mekri (after Ptah, Egyptian creator God, brother of Bes, patron of craftsman), Thoth-Amon (after Thoth). This is interesting for two reasons. While Stygia, for the most part, was the precursor of ancient Egypt, the Stygians worshipped the Elder God Set, not the Heliopolitan God Seth, who usurped his worship in later years. Some of the other gods were certainly around then, as witnessed by the numerous mentionings of Bast, etc. Also of some small interest might be the fact that Thoth, the apparent namesake of Thoth-Amon, is the ibis-headed scribe to the gods. The Hyborian God Ibis was a longtime enemy of Set. Whether there is a definite connection between Thoth and Ibis is uncertain, but seems quite possible. More prominent individual members receive individual entries, and this profile covers only the actions of the Black Ring as a group. Zula will eventually receive his own entry. other "Black" or Ring" characters, items, groups, etc., in the Hyborian or other eras. She was the lover and co-conspirator of Hak-Heru. She attempted to purchase Conan when he was offered on auction in the streets of Kheshatta. She was infuriated when she was outbid by Zula, and sent a demonic creature to attack him. Later, during the attack by the Meroans, she advised Hak-Heru to hold back the Sky Horde, so that the other members of the Black Ring would need to be saved by him, thus insuring his primacy. When Imhotep confronted Hak-Heru, Athyr-Bast's lover tossed her off of his winged horse, to divest himself of her unneeded weight. She was saved from a fall to her death by Zula. She foolishly attacked Thoth-Amon upon his return, and was easily overpowered by him. Only because she had recently join the ranks of the Black Ring did Thoth-Amon spare her. 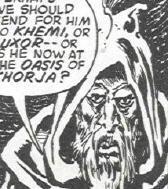 An elder member of the Black Ring, he taunted Hak-Heru, asking him whether he should contact Thoth-Amon for his opinion on Hak-Heru's plans. He became the temporary leader of the Black Ring during one of Thoth-Amon's journeys. His power is what most likely drew the attention and affections of Athyr-Bast. (Savage Sword of Conan#203 (fb)) - During Thoth-Amon's absence, Hak-Heru summoned the Sky Hordes of Imhotep. He managed to steal the amulet of Imhotep, enabling him to take control of the Sky Horde, and thus capture Imhotep as well. However, knowing that the Ravager of Worlds would always nurture rebellion in his heart, and knowing he could never slay the demon, Hak-Heru instead used the amulet to change him into the form of a Stygian. After one year's time, this spell would completely transform Imhotep into a mortal, making his susceptible to death. Hak-Heru then had the Sky Hordes cast the Ravager into the Stygian deserts. (Savage Sword of Conan#206) - Hak-Heru opposed Zula's recommendation to allow Conan to lead the forces of Kheshatta against the Meroans, but allowed the decision to rest on a game of Zinat, at which Zula defeated him (using Conan as the pawn). During the assault on Kheshatta, Hak-Heru held off using the Sky Hordes, so that the other members of the Black Ring would need to be saved by him, thus insuring his primacy. When the Meroans threatened to overtake Kheshatta, Hak-Heru summoned the Sky Hordes to slaughter the Meroans. Imhotep himself confronted Hak-Heru, and he tossed Athyr-Bast her off of his winged horse, to divest himself of her unneeded weight, sending her to seeming death on the ground outside Kheshatta. Hak-Heru used the amulet to blast at Imhotep, but he allowed himself to get to close to the demon, who skewered him with his scythe, and then sliced him completely in half, killing him.